Borrowing lyrics from Ella Fitzgerald’s Summertime tune seemed to fit with this Friday Photo post theme of Summer fun! Stumped for what to do this summer? You can take a hint from some works of art in the DMA’s collection. Why not take a run or bike ride along White Rock Lake? 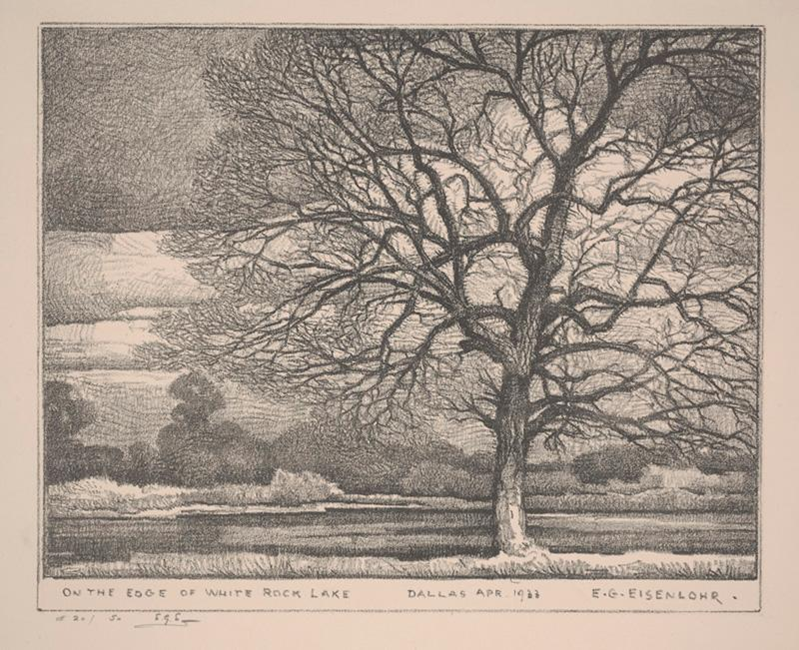 This urban oasis has provided inspiration to many North Texans over the years, including Edward G. Eisenlohr who documented the early twentieth-century landscape of Dallas in over 1,000 drawings, watercolors, pastels, oil paintings, and lithographs. Jump in! One of the best ways to beat the heat is taking a dip in a local swimming pool, but would you ever think you could swim at Dallas City Hall?! Well back in 1984 that dream was a reality. William H. Whyte had the idea to revitalize the area around City Hall, and these ideas took shape as a beach party! 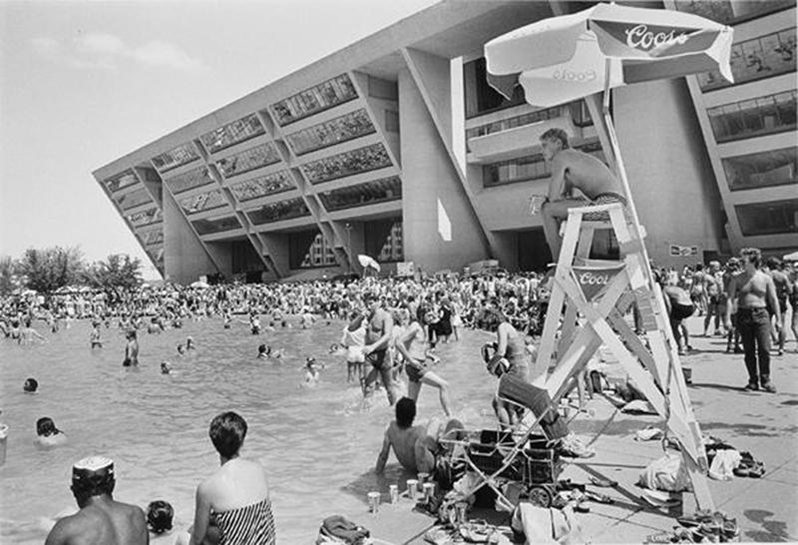 In June of 1984, the city trucked in tons of sand, and everyone grabbed their swimsuits to soak in some sun at City Hall. Luckily photographer Lynn Lennon, who was working on a project about public spaces for the Dallas Public Library, captured images of the epic event. Find out more about this quirky time in Dallas history here. If the pool isn’t your scene, then take advantage of the outdoors by packing a picnic or taking a day trip to one of the wonderful Texas State Parks in the DFW area. 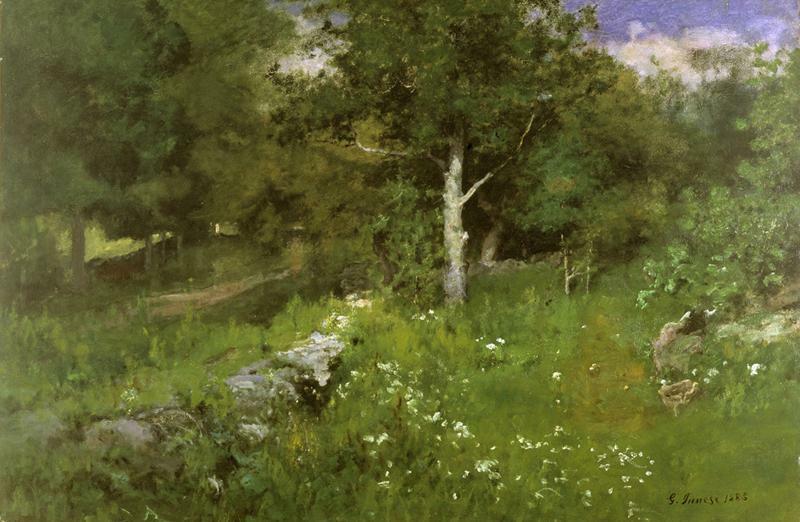 Artist George Inness often took inspiration from the outdoors, and sought to give his viewers the experience of nature through the shifting effects of light, atmosphere and season in his work. 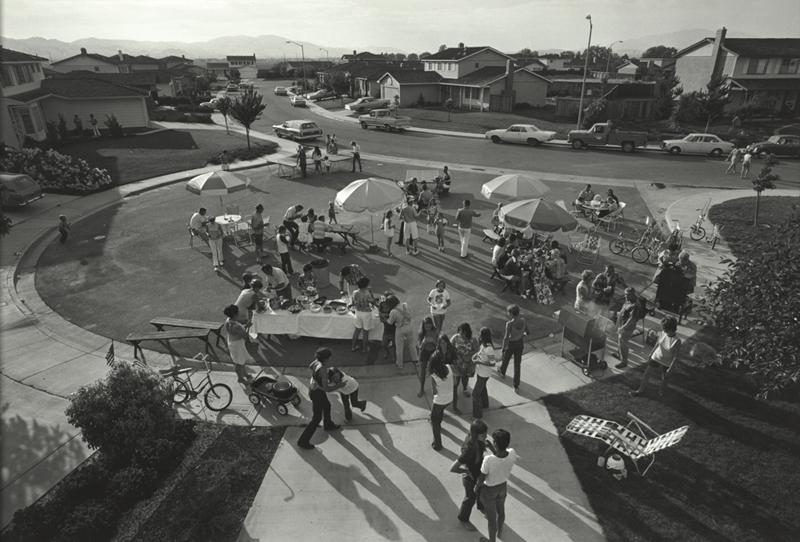 And perhaps the best summertime activity of all is the block party, where neighborhood or community members can come together to celebrate with delicious food, good music and great conversation. And it just so happens that TONIGHT is the Dallas Arts District block party! Come celebrate the summer at this annual event that brings together programs like the Crow Collection After Dark, ’til Midnight at the Nasher Sculpture Center, and of course the exciting activities of Late Nights at the DMA! It’s another gorgeous sunny day in November here in Dallas. 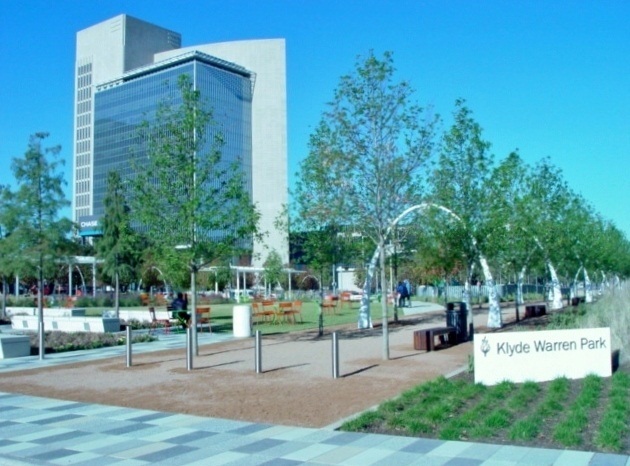 This warm and temperate fall weather could not have been more perfect for the recent opening of the new Klyde Warren Park right across the street from the Dallas Museum of Art. Just two weeks ago, this new urban green space celebrated it’s grand opening with over fifty free programs and a whopping 44,000 excited visitors. The DMA also participated in the lively festivities, offering outdoor art-making workshops and even a re-enactment of the ancient Maya ballgame in connection with our exhibition The Legacy of the Plumed Serpent in Ancient Mexico. The park continues to provide free daily programs, and has already become a populated community space beloved by the locals. This 5.2 acre deck park features a children’s playground, a gated dog park, putting greens, ping-pong tables, a reading area, and plenty of open green grass to play or picnic on. With something for absolutely everyone, the park brings people together from all walks of life. 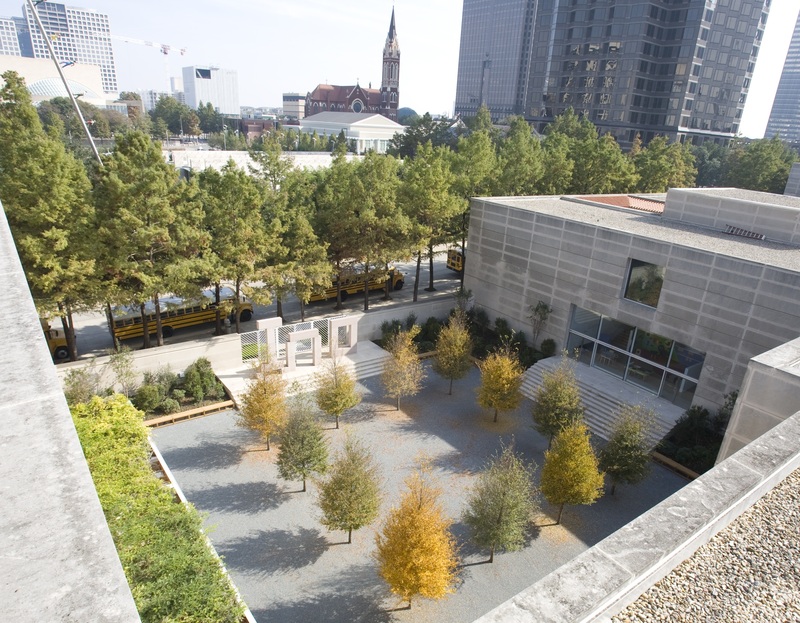 If you’re taking advantage of this wonderful weather and want to explore some of the DMA’s outdoor spaces, we have a couple beautiful spots for you to check out as well. For a tranquil stroll surrounded by trees, waterfalls, and life size sculptures, I highly reccomend heading out to the Sculpture Garden: it’s the perfect place to find inspiration or relaxation. The Fleischner Courtyard is another great outdoor space to enjoy some sun or shade. There are a few special areas of the museum where the archituecture allows for the exterior and interior space to interact, creating a sense of the natural world from the inside. 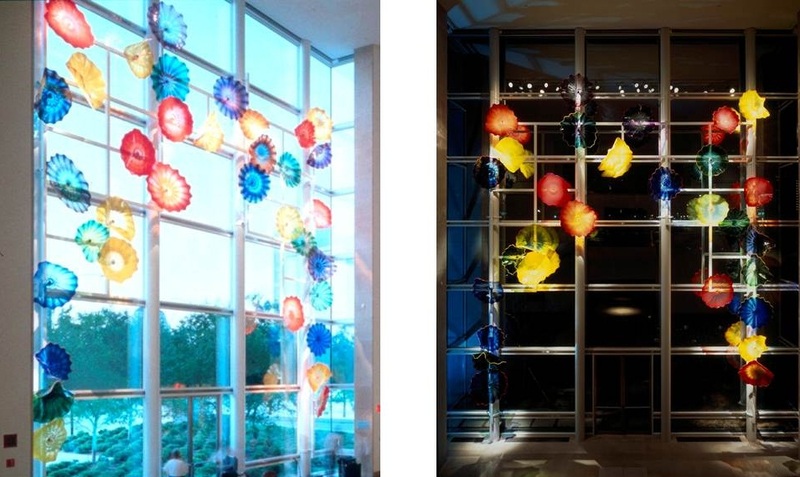 One of my favorite such places is the Atrium Cafe, where colorful glass Chihuly flowers float in the frame of the floor-to-ceiling window. With the colors made vibrant by sunlight and romantic by moonlight, it’s a breath-taking sight at any time of the day. The recent Karla Black installation titled Necessity seems to also create a similar relationship between man-made objects and nature. Cascading down from the ceiling in front of the glass doors to the Sculpture Garden, the cellophane of this large-scale sculpture catches the natural light and produces a sparkling, rippling effect much like a stream or waterfall. The holes in the sculpture and translucent material allow for glimpses of the trees and nature just beyond the doors of the artwork. While standing in the concourse it’s easy to feel as if you’re transported to an outdoor oasis. I hope you all enjoy this weather while it lasts- you now know where I go to soak up the sun! There’s something about little sparkling lights that can transform a tree into something magical. 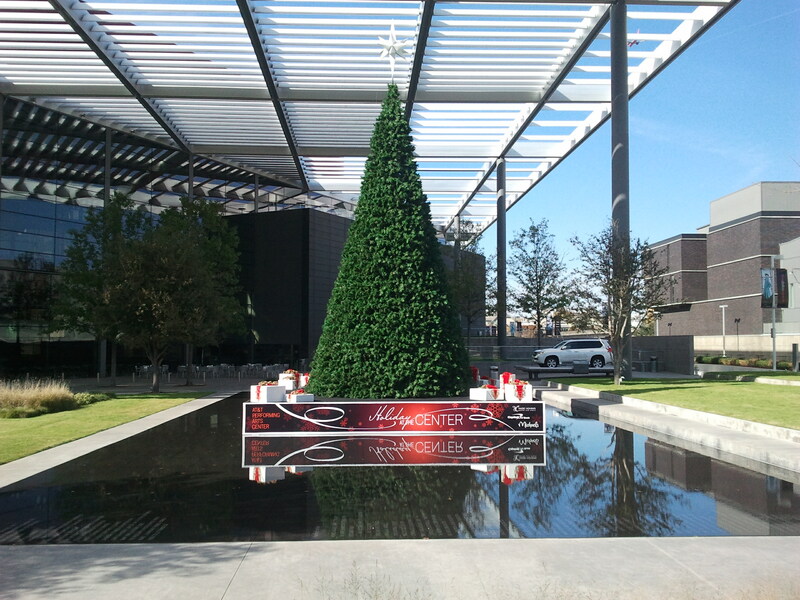 Come down to the Dallas Arts District tonight to see the lighting of this beautiful tree during Holidays in the District. Activities start at 5:30 p.m. and include horse and carriage rides, art activities, pictures with Santa, live music and dance performances, and the unveiling of an original work of art created specially for the evening. Food trucks will provide delicious treats, with the grand tree lighting ceremony at 7:03 p.m. Make sure you visit the DMA booth and create a holiday print! Last year, the AT&T Performing Arts Center opened in Downtown Dallas, and everyone celebrated the completion of the Dallas Arts District. October marks the one-year anniversary of the ATTPAC, and a month-long celebration has been planned throughout the Arts District, including performances, festivals, and more. Art in October will end on October 31st with a Closing Celebration, including free admission to the DMA. A complete calendar of events is available online. Not only is the Arts District a great place to experience art and culture, but it’s also a wonderful place to explore architecture. Below are some photos that I took between rainstorms this week of some of my favorite sites in the Arts District. I hope you’ll bring your students down to explore the Arts District, too! We have a new summer blog post schedule. Look for new posts on Wednesdays and Fridays. Have a fabulous summer! The opening of the AT&T Performing Arts Center last fall brought our friends at the Dallas Theater Center (DTC) to the ever-growing Dallas Arts District. Having comfortably settled into their new home at the Dee and Charles Wyly Theatre, the DTC has developed programs and collaborations as innovative as the building itself. Lisa Holland, Director of Education and Community Programs at the DTC, gives us a peek behind the scenes. Tell us about your new home at the Wyly Theatre. The Wyly Theatre is remarkable – there’s not another theater like it in the entire world. The flexibility that it affords is unparalleled and I think that we, as the primary tenants, are going to learn about this building as time goes on. I think the possibilities are going to be limitless in this building. I also think our patrons are going to be the lucky beneficiaries of seeing what this building can do. It’s like a giant transformer. What that provides to the patron in terms of the audience to artist relationship is going to be powerful and immediate. There’s nothing like it. Also, the synergy between other organizations in the Arts District and the potential collaborations that exist now is so thrilling. I think about how we can collaborate with our friends and family at the Arts District in ways that will be really engaging and exciting. To walk down the street and see who you’ll run into, or walk down the street and have a meeting at the DMA – it’s exciting. Do you ever consider integrating or thinking about works of art related to your programs? Absolutely. In the past, we’ve incorporated a visual arts component in our SummerStage program. I believe that whatever kind of artist you are, you need to “feed your hopper”. In other words, you pour into yourself different experiences, whether it’s a trip to the zoo or going for a walk and looking at leaves. You never know what will inform your work as an artist. Also, we deal with a lot of visual arts formal elements like color, line, and composition in the theater. And, we have had collaborative events with the DMA in the past, such as sending artists to the DMA and working with Arts & Letters Live. Tell us about the Shannon and Ted Skokos Learning Lab, your new partnership with Booker T. Washington High School for the Performing and Visual Arts. It was brand new this year, and it was a resounding mutual success. Last spring, we auditioned the rising juniors and from that group chose eighteen seniors. The Learning Lab has three components. Kevin Moriarty (DTC Artistic Director), Charlton Gavitt (Booker T. Washington High School Theater Cluster Faculty), and I team-taught the class component, which occurred every other day, all year long. The second component is a twenty-hour internship that students complete outside of class hours. The final component is a performance project, in which we paired the students with our professional acting company, and they performed ten scenes in the Wyly Theatre with the professional actors. The students also came to every single show we produced this year, free of charge. This is a super exciting program, and I don’t think anywhere else has that sort of integrated relationship between a school and a professional theater with that kind of access. The program is a great example of the kind of collaboration that can happen in the Arts District – it was so simple to walk across the street, teach, and walk back to my office. How did you come to your position as Director of Education & Community Programs? I grew up in the theater. My parents took me to theater and I’ve been a theater student my whole life. After I earned my graduate degree in directing, I was hired as one of two artistic directing interns at the Dallas Theater Center thirteen years ago. I was hired to work in the artistic office after my internship year, and I basically never left. I defected into the education department about halfway through my tenure, but that made sense because my undergraduate degree is in theater education. What program/performance are you most looking forward to this summer? We have a program called SUPERStage (SummerStage’s alter ego), where we have theater day camps for kids ages 4-14. I’m also looking forward to our summer production It’s a Bird…It’s a Plane…It’s Superman. I’m so excited about having a mainstage show running concurrently with our SUPERtage program. Our SUPERStage students will have access to what we do in a primary way, and we’re going to enfold into the curriculum what is happening on stage so it becomes a learning lab of sorts. It’s going to be awesome. Superman – what can you say – there’s flying – it’s Superman!